Angel Delgado’s dominance is well-known throughout the BIG EAST. He’s not only a great rebounder, he’s consistent and has been for three years. That’s what separates the Dominican Republic native from the rest of the pack of big men in the conference. From the outset of Sunday’s showdown between Seton Hall and St. John’s, it was looking like the junior star was going to put up his 37th career double-double. Ho-hum, right? But on Sunday, another day at the office for the junior star turned into a historical outing. The big man posted up a 21-point, 20-rebound performance, becoming the first Pirate to ever put up a 20-and-20 performance in a BIG EAST game and the first to do so in any contest since the late Eddie Griffin in 2000. The feat has not been achieved by a BIG EAST player since Providence’s “Greedy” Peterson in 2010. An undersized St. John’s frontcourt had no answer for the double-double machine in an 86-73 win for The Hall, giving the Pirates’ a much-needed victory to snap a three-game skid. For seventh-year head coach Kevin Willard, seeing Delgado’s dominance lead to a SHU win is nothing new, as the Pirates are now 30-7 when the big man doubles up. As for perspective from the opposition, Red Storm head coach Chris Mullin said Delgado looked like Philadelphia 76ers legend Moses Malone. Averaging 31.1 minutes per game, which is second on the team, Delgado was given three days of rest following Monday’s 76-46 loss at No. 1 Villanova. What stood out about the performance was not just how good Delgado was, but how crisp his guards were in feeding him inside. 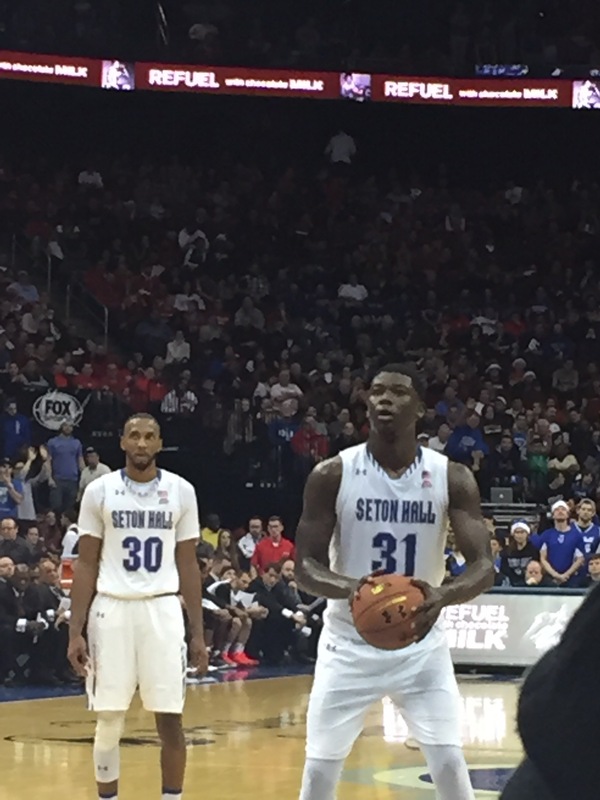 Seton Hall has been out of sync offensively as of late, but a concerted effort to get #31 the ball from the get-go was, as expected, a successful formula. Adding to Carrington’s eight dishes was Madison Jones, who put up five of his own. It was just what the doctor ordered for Willard’s veteran group, which next hosts No. 13 Butler on Wednesday at 8:30 pm. While the Bulldogs have three players averaging at least five boards per contest, nobody puts up 5.4 per game. That’s right, Delgado leads every Butler player by at least seven rebounds. The important number to watch for The Hall is turnovers. The same efficiency they used throughout much of Sunday needs to come through against Butler, which holds a +4.2 turnover margin. If the Pirates are going to find a difference, that’s where it can come from. It’s a huge opportunity for SHU, which will aim to get back to .500 in BIG EAST play and build a budding resume.